The Eastern Interstate 84 follows the U.S. 6 corridor between Scranton, Pennsylvania and Hartford, Connecticut and the Wilbur Cross Highway northeast from U.S. 6 to Interstate 90 (Mass Pike) at Sturbridge, Massachusetts. I-84 is a well traveled freeway, and serves as part of a long distance alternative between eastern Pennsylvania and New England. I-84 begins at the exchange between I-81 & 380 and U.S. 6 in Dunmore, initially following I-380 before branching eastward to New York. The freeway enters the Empire State at Port Jervis on a northeast course to NY 17 at Middletown and I-87 (New York Thruway) at Newburgh. Beyond Shenandoah, I-84 dips southeast to meet I-684 at Brewster before turning back east into Connecticut. Interstate 684 extends south to White Plains and Interstate 95. I-84 enters Connecticut along the Yankee Expressway near Danbury, where U.S. 7 joins the freeway on a brief overlap. Beyond Newtown, Interstate 84 angles northeast to Waterbury and Interstate 691. I-691 branches eastward to Meriden as the Yankee Expressway reaches Southington. I-84 continues on a northeast course to the Hartford metro area, entering near West Hartford. The freeway arcs north of Downtown Hartford to meet Interstate 91 on the banks of the Connecticut River. As I-84 continues eastward from Hartford, it follows the Wilbur Cross Highway. A second branch of I-84 (I-384) spokes east near Manchester as the Wilbur Cross Highway bends northeast for its remaining course to Massachusetts. Interstate 84 passes through Sturbridge on its final stretch, ending at a trumpet interchange with Interstate 90 (Mass Turnpike) opposite Wells State Park. Interstate 84 generally traverses a hilly course, including the Poconos in Pennsylvania, the historic Hudson Valley and the foothills of Connecticut. It also forms part of an outer loop of New York City via I-684 and I-287 and is a major thoroughfare for Connecticut-based commuters. Interstates 84 & 380 replaced U.S. 611 southeast from Dunmore to their split near Elmhurst. East from Milford, Pennsylvania, I-84 parallels or overlays U.S. 6 to Hartford, Connecticut. The freeway also intertwines with U.S. 202 between Brewster, New York and Danbury, Connecticut while briefly overlapping with U.S. 7. Further east U.S. 44 travels nearby between Downtown Hartford and Manchester. As originally designated in Connecticut, the easternmost segment of Interstate 84 ran from Hartford, Connecticut to Sturbridge, Massachusetts. This course was altered at the AASHTO meeting held June 23, 1969, when I-84 was shifted east to connect Hartford with Providence, Rhode Island, along the Manchester and Willimantic bypasses. I-86 overtook the former routing of I-84 along the Wilbur Cross Highway to Massachusetts. 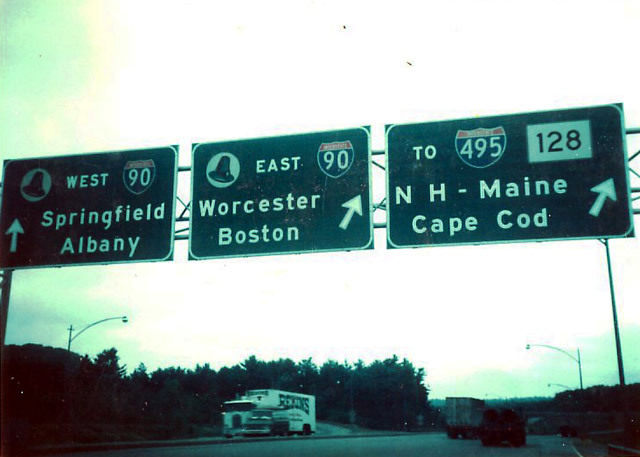 With the 1969 AASHTO decision, I-84 was planned to continue east along the U.S. 6 corridor from Hartford to Providence, connecting to either U.S. 6 (formerly Rhode Island 195) or Rhode Island 37 at Interstate 295 in the Ocean State. The Manchester bypass was completed in 1971 and the Willimantic bypass opened in 1973, with both signed as I-84. The remainder of the freeway was never built due to environmental concerns surrounding Nathan Hale State Forest in Connecticut and Scituate Reservoir in Rhode Island.2 This ultimately led to the cancellation of I-84 between the Willimantic Bypass and I-295 / RI 195 at Johnston. Interstate 84 was officially eliminated by AASHTO within the state of Rhode Island on October 1, 1983. 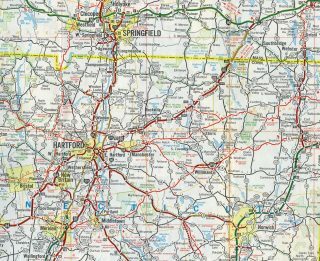 During the following AASHTO meeting on May 23, 1984, I-84 was returned to follow its original alignment between Hartford and Sturbridge while I-86 was decommissioned. The same meeting also established Interstate 384 along the Manchester bypass to Bolton while U.S. 6 was moved to the Willimantic bypass. 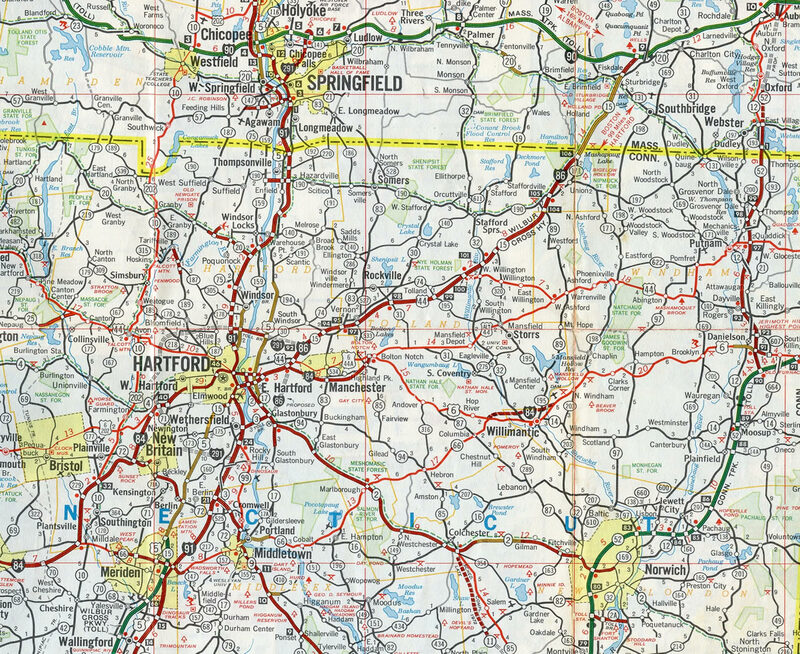 Interstate 84 was proposed to run east from Hartford to Providence between 1969 and 1984. The lone two portions of freeway built were the Manchester and Willimantic bypasses. The route was to also use the Connecticut Turnpike spur (CT 695) east from CT 52 to U.S. 6 at South Killingly. Traveling south along the first mile of Interstates 84 & 380. I-84 east splits three miles ahead for Port Jervis as I-380 continues south for the Pocono Mountains. Photo taken by Chris Elbert (07/06). Historic look at button copy signage posted at the eastern end of I-84 (former I-86) with I-90 (Massachusetts Turnpike) near Sturbridge. Photo taken by Michael Summa (1976). End advisory sign posted for the eastern terminus of Interstate 84 at Interstate 90 (Massachusetts Turnpike). Traffic not departing the freeway for U.S. 20 (Exits 3A/B) defaults onto the toll road in 1.50 miles. Photo taken 08/09/04. Eastbound at the ramp departure of Exit 3A onto U.S. 20 (Charlton Road) east. U.S. 20 provides an alternate route to the city of Worcester in lieu of the Mass Pike. The US highway meets Interstates 290 & 395 12 miles to the east at Auburn. Interstate 290 migrates north from there into downtown Worcester. Photo taken 08/09/04. Exit 3B loops onto U.S. 20 west for Main Street in Sturbridge. U.S. 20 continues from Massachusetts 131 two miles to Fiskdale (Massachusetts 148), five miles to Brimfield (Massachusetts 19), and nine miles to Feltonville (Massachusetts 67). Photo taken 08/09/04. Interstate 84 partitions into ramps for Interstate 90 east to Boston and west to Springfield and Albany, New York. The Mass Pike next meets Interstates 290 & 395 12 miles to the east near Worcester. Photo taken 08/09/04. Interstate 84 concludes at the trumpet interchange with Interstate 90 (Mass Pike). Springfield is a 30-minute drive to the west. Photo taken 08/09/04. One-half mile guide sign on Interstate 90 (Massachusetts Turnpike) for Interstate 84 west (Exit 9). I-84 west connects locally to Sturbridge (via U.S. 20) and Hartford, Connecticut. The Massachusetts Turnpike will meet I-395 south and I-290 north in 12 miles. Photo taken by Steve West. Two mile advance sign for Interstate 84 west (Exit 9) posted on Interstate 90 (Massachusetts Turnpike) westbound. Interests to New York City are directed to follow I-84 west. Photo taken by Greg Goldman (07/29/05). The Mass Pike expands to three lanes in anticipation of the Exit 9 trumpet interchange with Interstate 84 west. I-84 cross paths nearby with U.S. 20 (Charlton Road / Main Street) at the town of Sturbridge. U.S. 20 parallels Interstate 90 from Boston west to Pittsfield in Massachusetts, and meets Interstate 84 between Charlton City and Fiskdale. Photo taken by Greg Goldman (07/29/05). Massachusetts 49 crosses over Interstate 90 (Mass Pike) ahead of the split with Interstate 84 west. Interstate 84 follows the Wilbur Cross Highway southwest nine miles to the Connecticut state line on the 44-mile drive to Hartford. Traveler interests to New York City can use a multitude of routes between Interstate 84 and Interstate 95 including Interstate 91, Connecticut 8, U.S. 7, and Interstate 684. Photo taken by Greg Goldman (07/29/05). The westbound beginning of Interstate 84 departs Interstate 90 (Mass Pike) west via Exit 9. I-84 travels southwest to Hartford, Waterbury, and Danbury, Connecticut. I-90 continues west 27 miles to I-291 at Chicopee and Springfield, and 110 miles to I-787 at Albany. Photo taken by Greg Goldman (07/29/05). Interstate 84 west and Interstate 380 north reach Exit 1, Tigue Street. The next exit is with Interstate 81 north to Binghamton and south to Harrisburg. Photo taken by Chris Elbert (07/06). Interstate 84 west/380 north at the departure of the eastbound off-ramp to the U.S. 6 Carbondale freeway. 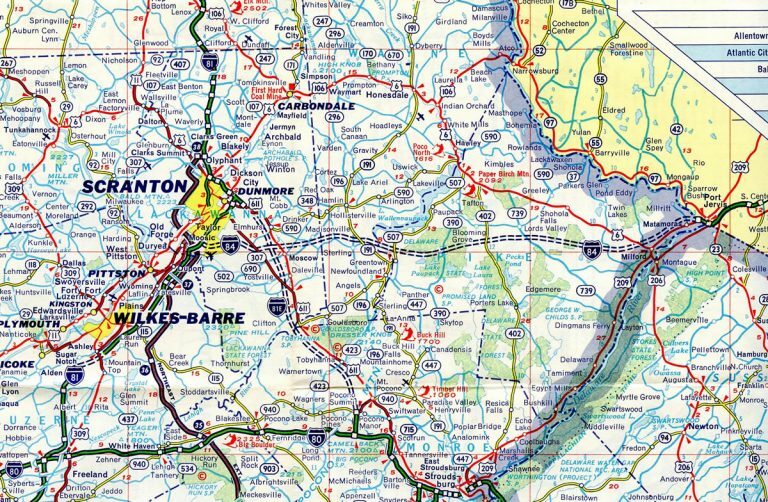 The paired Interstates descend from the Moosic Mountains, home to Lake Scranton, to the city of Dunmore. Photo taken by Chris Elbert (07/06). 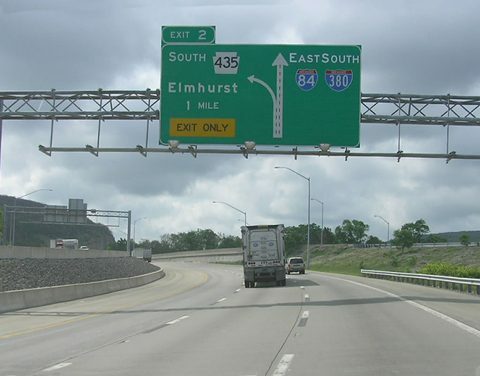 Scranton Exits guide sign on Interstate 84 west/380 north for the pending terminus interchange with Interstate 81. Interstate 81 passes downtown Scranton to the east and north. The city is home to the University of Scranton, Marywood University, and the Steamtown National Historic Site among other points of interest. Photo taken by Chris Elbert (07/06). Interstate 84 and 380 prepare to separate for Interstate 81 north to Binghamton and south to Wilkes-Barre. The freeway otherwise carries six lanes between Exit 2 and Interstate 81. Photo taken by Douglas Kerr (07/00). Interstate 81 south and U.S. 6 east two miles prior to the beginning with Interstates 84 & 380. Photo taken 07/04/05. One mile ahead of the stack interchange with I-84 / 380 and U.S. 6 along I-81 south. Photo taken 07/04/05. PA 347 (North Blakely Street) spans I-81 ahead of the departure to I-84 east and I-380 south (Exit 187). This section of freeway was reconstructed during the early 2000s, with collector distributor (c/d) roads built for the PA 347 interchange (Exit 188). Photo taken 07/04/05. Traffic leaves for I-84 / 380 and U.S. 6 along I-81 south. I-81 turns southwest at the stack interchange for Wilkes-Barre, 17 miles ahead. Photo taken 07/04/05. Traveling under Reeves Street, a c/d road funnels motorists to the approaching split with Interstates 84 & 380 and U.S. 6 east. Traffic from PA 347 (North Blakely Street) bound for I-81 south will use a single lane ramp ahead at the upcoming stack interchange. Photo taken by Chris Elbert (07/06). Through traffic to Interstate 81 departs to the right, while two lanes continue to Interstate 84 east, Interstate 380 south, and U.S. 6 east. Photo taken by Chris Elbert (07/06). First advance sign of the forthcoming beginning of Interstates 84 east and 380 south along Interstate 81 north. Photo taken by Chris Elbert (07/06). I-84 travels east from the Scranton area to Port Jervis at the New York border while I-380 travels southeast connecting I-81 with I-80 near the Poconos. U.S. 6 otherwise branches eastward to Carbondale. Photo taken by Chris Elbert (07/06). Lanes prepare to separate for I-84 / 380 and U.S 6 east. Photo taken by Chris Elbert (07/06). Interstate 81 continues north to Clarks Summit and Binghamton, New York, while U.S. 6 east and Interstate 84-380 depart for their respective destinations. Photo taken by Chris Elbert (07/06). Page updated September 30, 2018.